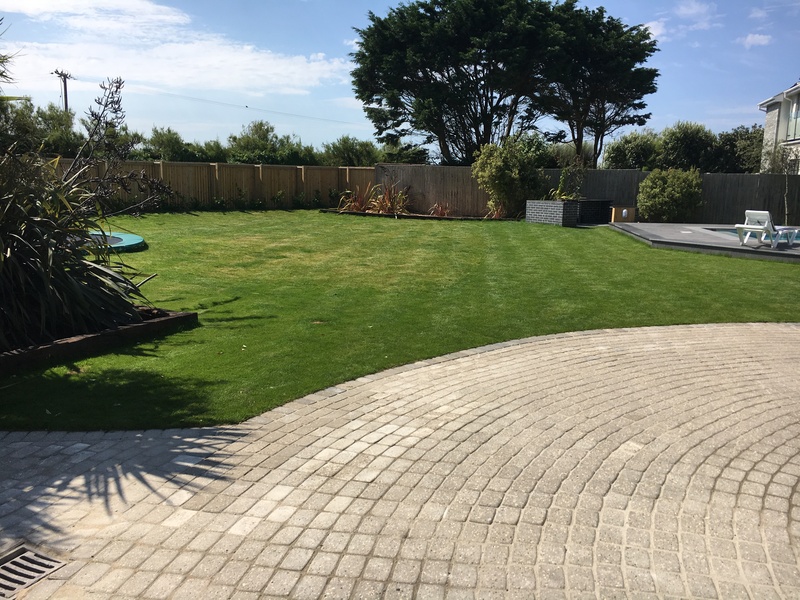 Set in the beautiful village of Constantine Bay, Beach Boys is a stunning modern glass fronted house completed in July 2017 with outstanding sea views across the blue azure waters of Constantine Bay and Booby’s Bay beyond. 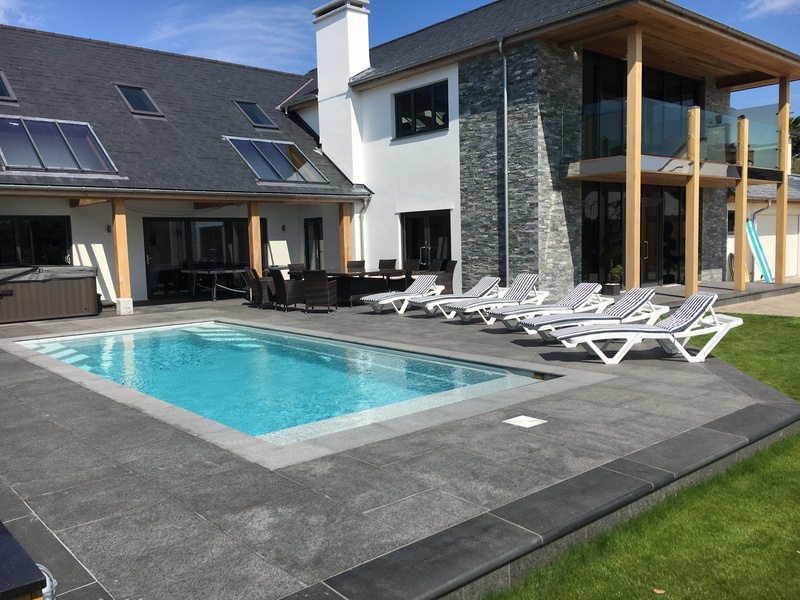 The house comes complete with a bubbly hot tub, a new Paramount Luxe Mirror Heated pool( 8500 x 3700 x 1500mm) – open mid May to mid September; weather permitting, located within a south facing courtyard together with loungers and an outside dining table and chairs. There is also a TESLA charger in the garage. Last but not least, a huge trampoline dug into the garden to give children hours of fun. Enjoy the breath taking sunsets from the comfort of your chair in the conservatory dining area or just sitting with a glass of wine in the living room. 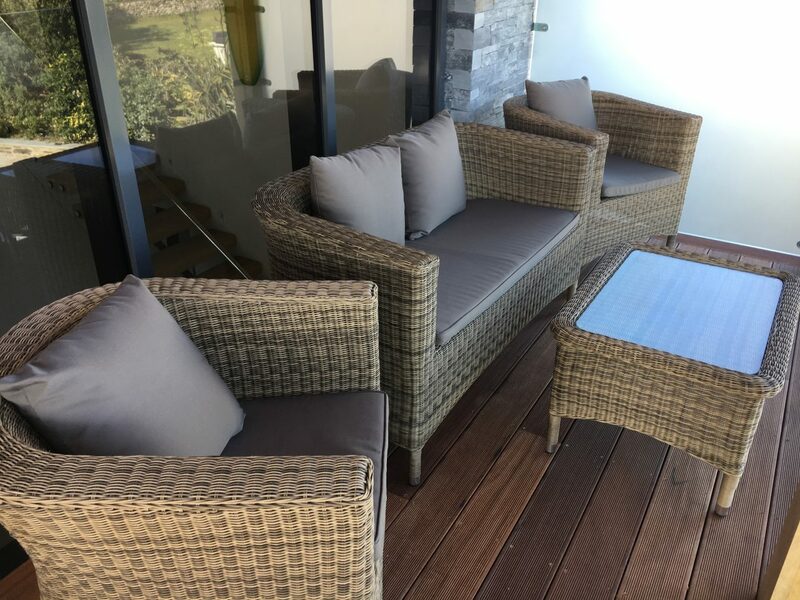 There are two balconies which captivate the sun throughout the day so take the opportunity in the morning to enjoy a lovely cup of coffee on the front garden side balcony whilst sitting on the lovely rattan furniture located there. 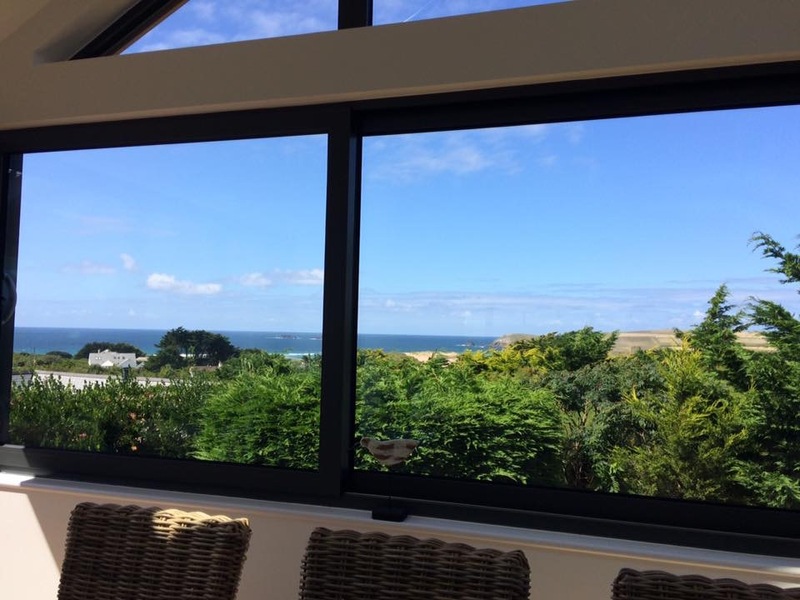 Beach Boys commands an enviable location being only 5/10 minutes walk away from 2 superb beaches; Constantine Bay and Treyarnon Bay. The bays of Porthcothan, Booby’s, Harlyn, Trevone and the ever popular coastal town of Padstow are but a short drive away. What more could you ask for; 7 bays for 7 days. With modern coastal interiors, this is the perfect house for families and couples alike. It has luxury features such as a built in Sonas Sound system, with speakers located in the main living room ceiling upstairs, a games/cinema room complete with table tennis and full sky movies and sport, underfloor heating throughout controlled by individual thermostats in every room plus zone lighting in the impressive galleried entrance hall and upstairs in the kitchen/dining/living room to create that special mood to suit every occasion. The striking white modern kitchen boasts a 3.1 metre island complete with integral hob, extractor fan and 2 Neff ovens both with warming drawers. There are two fridges and a freezer, a Nespresso machine, toaster, microwave and every cooking utensil and dish you could wish for ! Champagne, tumbler, wine and Gin glasses provide a suitable home for every drink you may desire ! In the utility area downstairs, there is an American style double fridge freezer to chill drinks/food and also plastic wine glasses, tumblers, plates and bowls for the outside pool area. The garden is completely enclosed with areas at the front and back to play in. Access is permitted through a coded pedestrian gate and entrance through double gates for parking 3/4 cars..
At Beach Boys, there is no need for transport (only legs !) as the beaches (Constantine Bay & Treyarnon Bay) are only 5/10 minutes walk away. The lovely Treglos Hotel is just around the corner, the local village shop 1 minute away which boasts an incredible wine area together with all of your food requirements and the famous Trevose Golf and Country Club only a 2 minute walk away; this has a large outdoor heated pool complete with sunbathing area that is open to non residents for a small fee per person. The Golf Club also hires out tennis courts and equipment to non members again for a small fee. 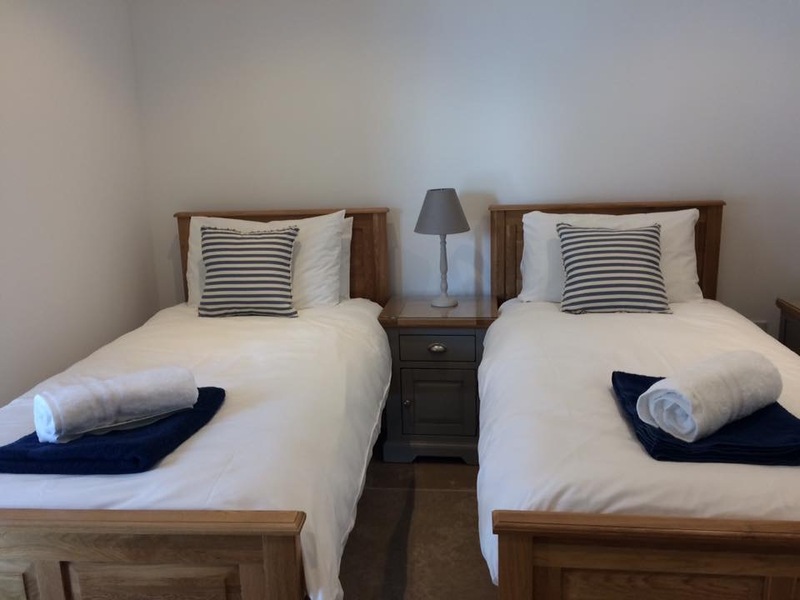 Constantine Bay Master King Bedroom First Floor – Sea View, Balcony, Dressing Room, King size Bed, En suite Bathroom with walk in shower & freestanding slipper bath, toilet, 1.2 metre sink with large overhead mirror plus heated towel rack. Double wardrobes, dressing table, shelving units. Two bedside tables with drawers and lamps. 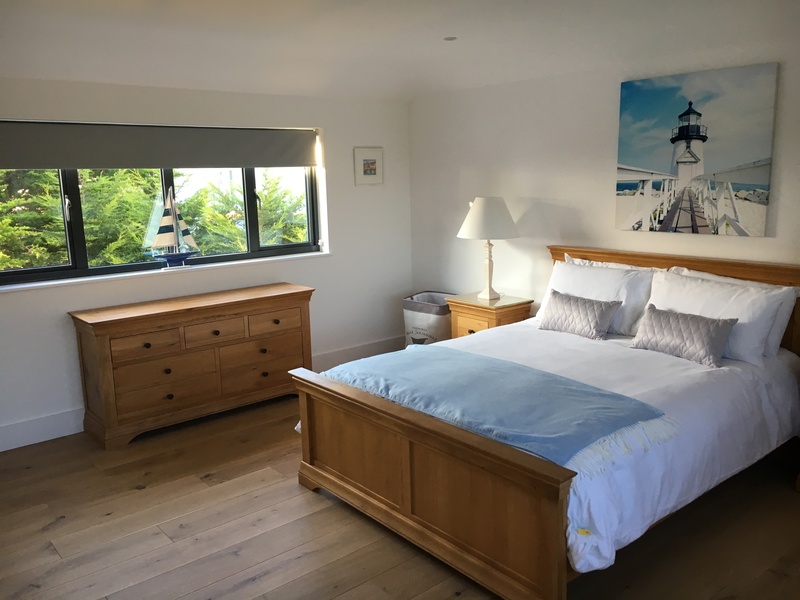 Padstow King Bedroom First Floor – Sea View, King size Bed, En suite with walk in shower, toilet, 1.2 metre sink with large overhead mirror plus heated towel rack. Two double wardrobes, dressing table with chair and mirror, chest of drawers. Two bedside tables with drawers and lamps. 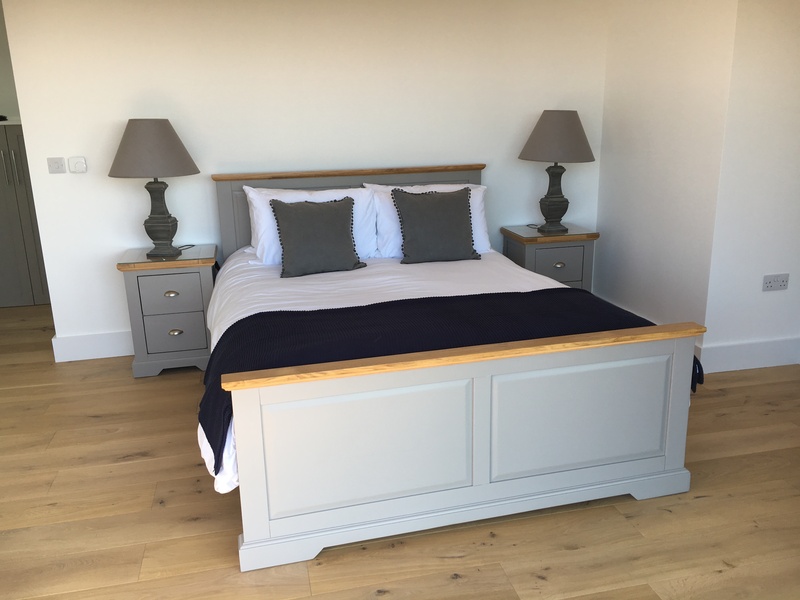 Harlyn King Bedroom Ground Floor – Garden View, King size bed, en suite with walk in shower, toilet, 1.4 metre sink with large overhead mirror plus heated towel rack. Two double wardrobes, chest of drawers. Two bedside tables with drawers and lamps. 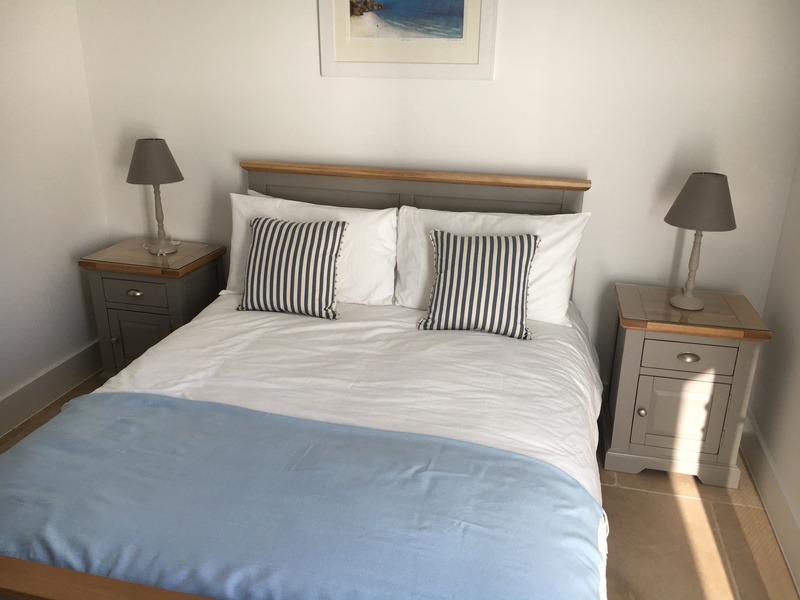 Porthcothan Double Bedroom Ground Floor – Patio doors lead out onto garden area, double bed. Two bedside tables with drawers and lamps. Wardrobe with drawers and chest of drawers. Rock Twin Bedroom Ground Floor – Patio doors lead out onto pool area, twin beds. Two bedside tables with drawers and lamps. large double wardrobe with drawers. dressing table with chair and mirror. 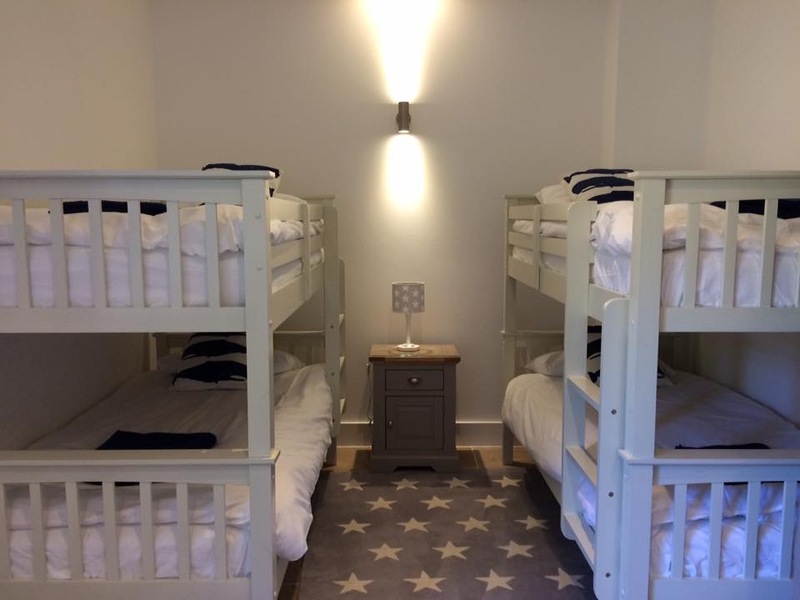 Treyarnon Bunk Beds Bedroom – Two sets of bunk beds, wardrobe with drawers, large chest of drawers, children’s small book case full of books. One bedside table with drawers and a lamp. Wetroom (located in Courtyard next to Hot tub) – with 2 showers, toilet, large sink and cupboard units plus heated towel rack. 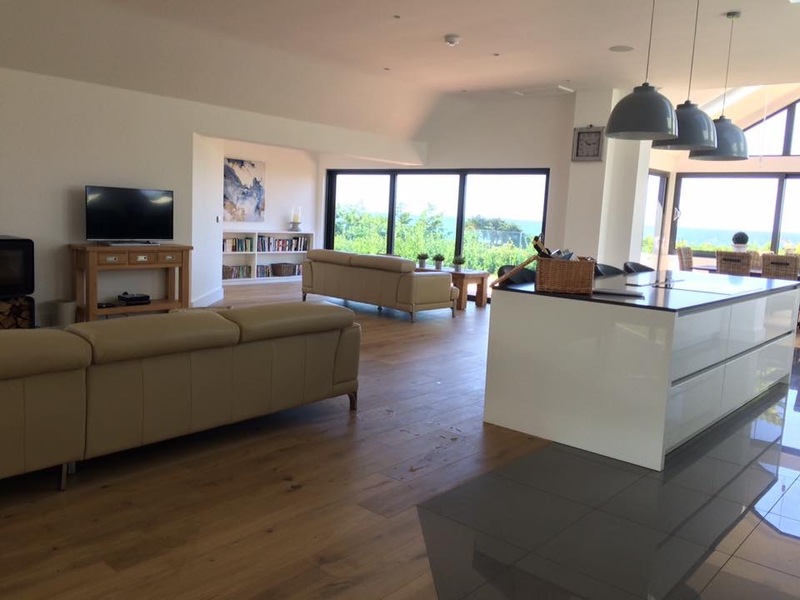 A beautiful white high gloss open plan kitchen with far reaching sea views. 3.1 metre island with integral hob and built in extractor fan and 4 grey bar seats. Two Neff ovens both with warming drawers. Two fridge/freezers. Nespresso Coffee Machine, toaster, microwave, kettle and every cooking utensil and dish you can think of. Large selection of glasses including tumblers, gin, champagne, cocktail and wine. Cutlery, crockery and plastic plates/glasses for the pool area. The dining room is located at the front of the kitchen in a large conservatory. Huge bi-fold windows draw back to expose the breathtaking view. Dine and enjoy the wonderful sunsets at night. 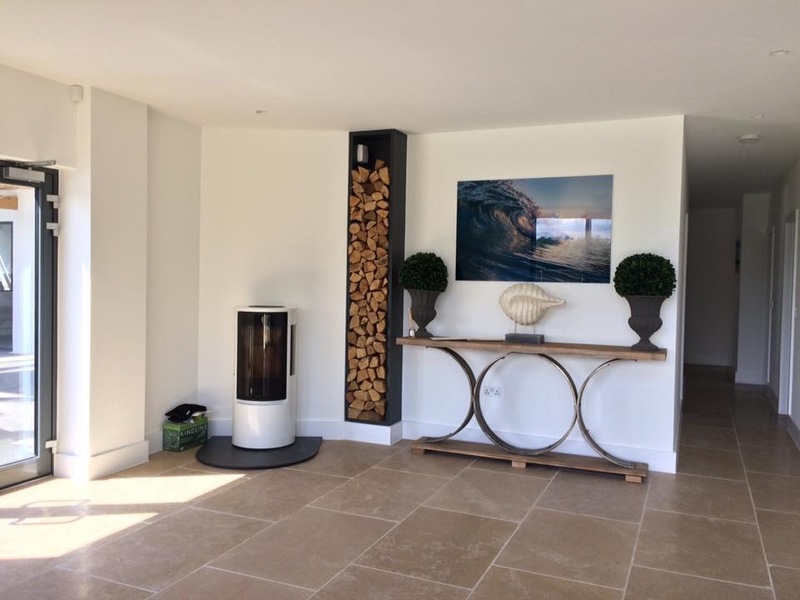 On entering the front doors at Beach Boys you will find a large galleried hall with a corner seat sofa and a log burner. The stairs lead up onto the first floor. This area really comes alive at night as each stair is lit and there is a fabulous neon surfboard on the wall as you walk up towards the first floor. The Utility room is next door to the hall. It houses a large American double fridge freezer, washing machine/tumble dryer, sink, drawers, iron, ironing board, laundry basket and pegs (washing line in back garden). The cloak/boot room has ample shoe and coat hanging places with large hanging radiator on the wall. 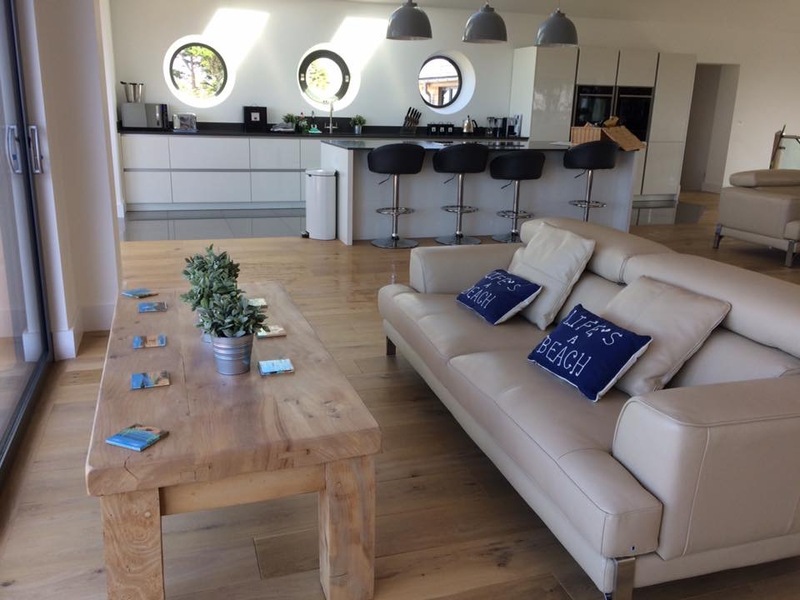 Large Leather corner sofa with sea views, log burner, flat screen tv (full sky tv and movies) and propeller coffee table. Leads out onto two balconies. One balcony with rattan furniture on the front garden side and another balcony on the sea side. 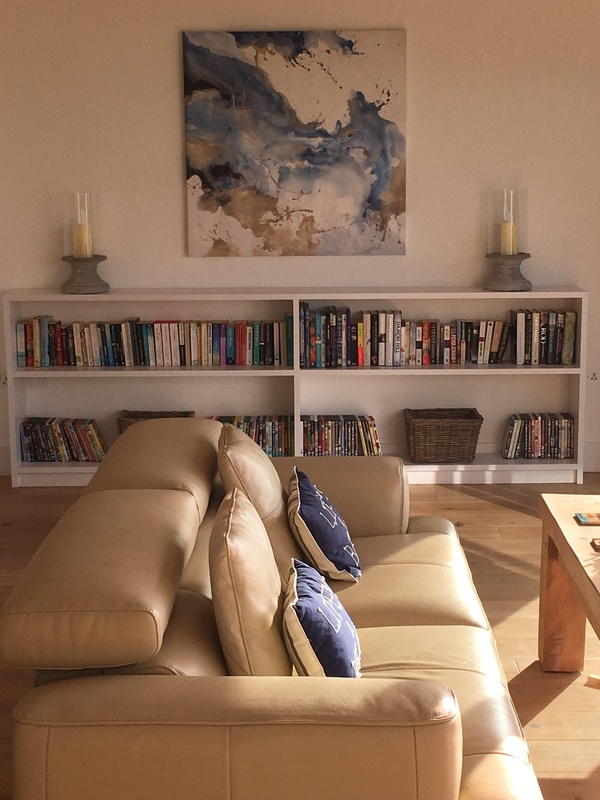 There is a 3 seater leather sofa located in front of the sea view balcony which commands spectacular views across Constantine Bay together with snug fleece blankets for those winter days by the open fire. 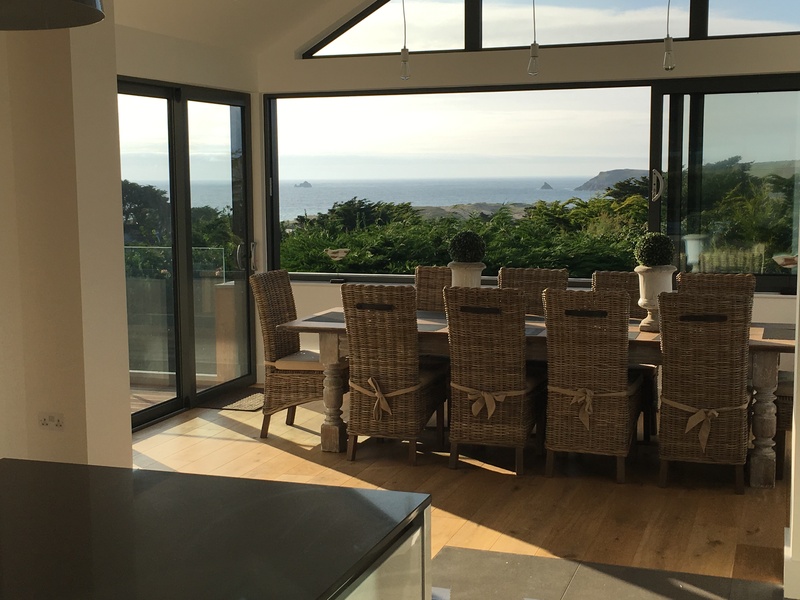 The large patio doors slide all the way back to provide a framed view of the sea. A bookcase is located by the smaller sofa that is full of books and Dvds to entertain and relax you. Primarily a chill out area for the children, this room has a huge flat screen television with surround sound and full sky tv with movies. There is a table tennis table which can be played indoors or outdoors. We also provide snug fleece blankets for the children to wrap up in and watch a movie. Large bi-fold patio doors lead out onto the pool area. We provide bath, pool towels (not Beach towels) and linen. The house is cleaned on your departure and your security deposit will be released once the housekeeping team are certain that the property has incurred no damages. 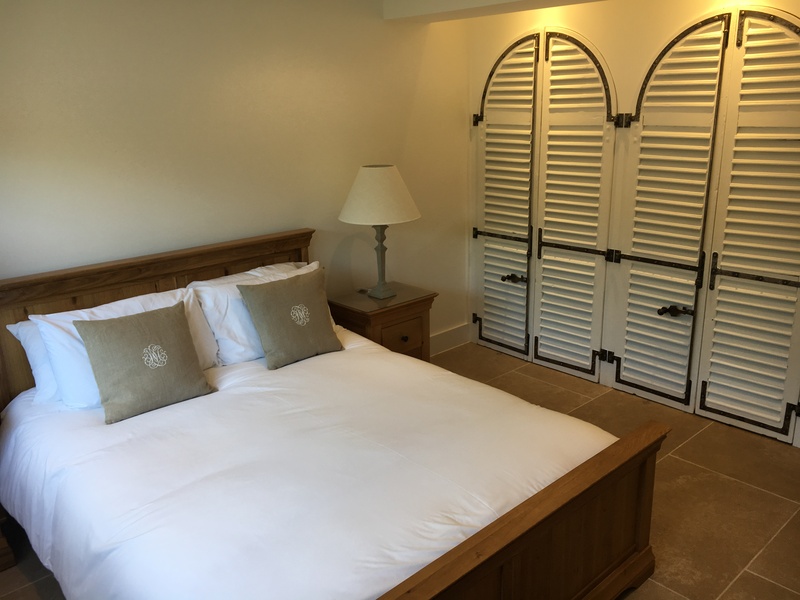 The lovely Treglos Hotel is just around the corner, the local village shop 1 minute away and the famous Trevose Golf and Country Club only a 2 minute walk away, which boasts a large outdoor heated pool complete with sunbathing area that is open to non residents for a small fee per person. The Golf Club also hires out tennis courts and equipment to non members again for a small fee. We are very sorry but the house is not accessible to wheel chair users due to the both steep and narrow wooden staircase; we believe it would not be possible or safe to carry a wheelchair upstairs to the living room area. There is also a large entrance step into the main property. Entry 3.00pm on changeover day; this is a Saturday in peak weeks but we can be flexible out of season. We provide a meet and greet service at 3.00pm on the arrival day for all our guests to explain the operational aspects of the house which in turn will make your stay a more pleasurable one. Strictly no pets due to severe pet allergies. 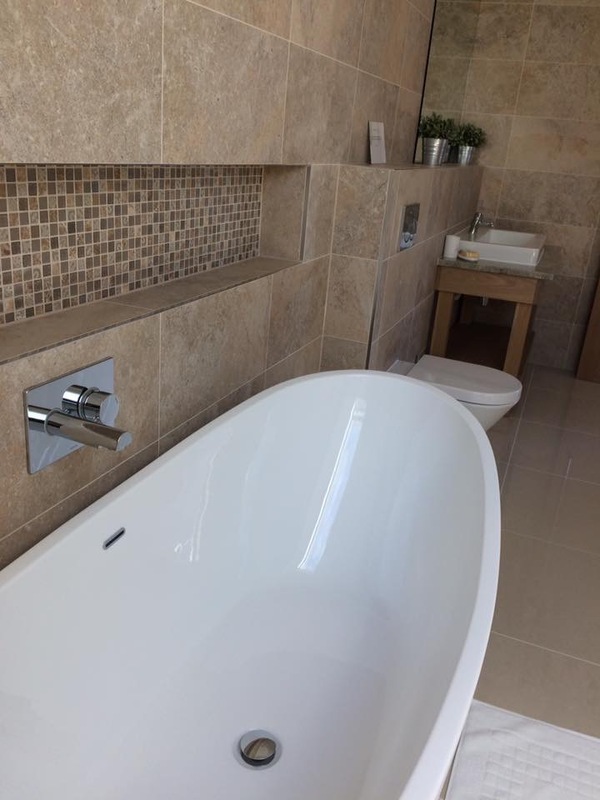 The house comes complete with a bubbly hot tub, a new Paramount Luxe Mirror Heated pool; 8500 x 3700 x 1500mm located – open mid May to mid September (weather permitting) within a south facing courtyard together with loungers and an outside dining table and chairs. Last but not least, a huge trampoline dug into the garden for adults and children alike. There is a large BBQ next to the swimming pool with a huge drum that takes coals. The garden is completely enclosed and and access is permitted through a coded pedestrian gate and double gates for cars. Parking for around 3/4 cars.